A women's match will be the main event of WrestleMania for the first time in history, WWE has officially announced. Charlotte Flair and Becky Lynch will battle champion Ronda Rousey for her Raw Women's Title in the final match of WrestleMania 35. 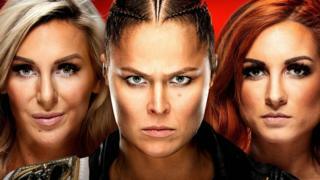 The three women have been part of a huge rivalry over the last seven months that has captured the imagination of WWE fans. Can Ayshah become a superstar wrestler? WWE's biggest show of the year takes place on Sunday 7 April at MetLife Stadium in New York, USA. Other matches on the night include Universal champion Brock Lesnar taking on Seth Rollins, AJ Styles versus Randy Orton, and Triple H battling Batista.